A coalition of more than 150 organizations and community members who work together to ensure all Providence children thrive – from cradle to career. With elevated rates of anxiety, trauma and depression among Providence children and youth, we recognize the importance of supporting social and emotional wellbeing if our children are to thrive. 8,500 Providence Public School District students were chronically absent in 2014-2015, and a third of the city’s Kindergarteners missed more than a month of school. CYC develops and advocates for inclusive, far-reaching, and comprehensive policy revisions and programmatic supports to improve student attendance. A welcoming, respectful and trusting school climate is essential for students to be motivated to attend school and be supported socially and emotionally when in school. 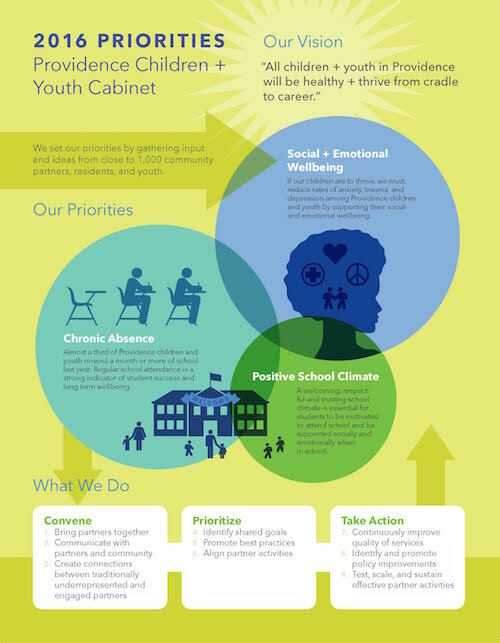 Our work on projects such as Building Trauma-Sensitive Schools and Positive Action are tangible ways we support positive school climate. Evidence2Success is a framework for engaging communities and public systems in improving child well-being. In Providence, residents, local leaders and systems have worked together to set goals, identify proven programs and make change for children in our community. In the West End and South Side of Providence, the CYC partners with residents, local leaders and champions to make sure children in this community are healthy and thriving. A case study on property remediation via community engagement. Read about how community engagement played a key role in creating the impetus to address a property with the greatest sense of urgency in a neighborhood.